Wellness Care - "An ounce of prevention is worth a pound of cure" That saying holds true for horses also. As part of our routine care we provide vaccinations, deworming, Coggins testing, and dental care. At the time of service we can discuss any issues you may have with your horse including nutrtional needs, training programs, geriatric care, etc. Time of need care - We offer care for your horse in case of medical colic, sickness, lameness, injury, metabolic problems, or chronic illness. We are equipped to provide intravenous fluids and most laboratory results are obtained within 24 hours. Pre-purchase examinations - An extensive physical examination, lameness evaluation, neurologic examination, and drug screen is offered by us prior to purchasing a horse. The information gathered is used by the prospective buyer and/or agent to determine whether the horse will be serviceable for it's intended use. The exam often includes laboratory testing, radiographs, and possibly ultrasound exams. Geriatric care - Aged horses can have sub-clinical health care issues that can be identified and treated before they become a problem. If your horse is over 15 years of age we recommend a complete physical examination and blood testing to establish baseline values. Dental Care - Dental care is an important aspect of your horses health care requirements. 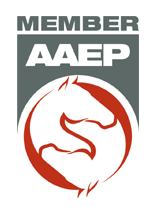 We recommend having your horses dental health evaluated yearly. Lameness examination - Evaluate the locomotion of your horse. We use a variety of techniques to identify the source(s) of lameness including physical examination and palpation, flexion tests, and joint and nerve blocks. 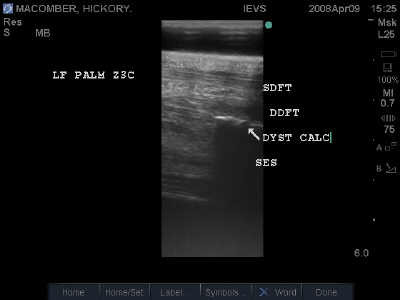 Radiography, ultrasound, and laboratory tests help us to further evaluate the source of your horse's lameness. Surgery - Standing or recumbant surgery of the horse is performed for castration, biopsy and laceration repair. More complicated procedures may be referred to a specialist. 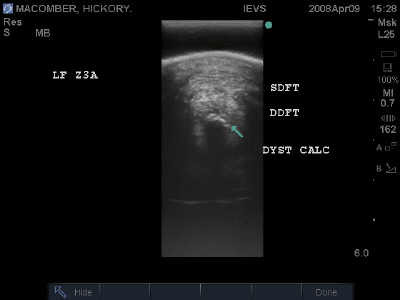 Ultrasonography - uses sound waves to evaluate soft tissues like tendons and ligaments, reproductive organs, and tumors. It is painless and non-invasive. Radiography- uses x-rays to visualize bone for abnormalities including arthritic changes, fractures, OCD lesions, bone cysts and bone infection. Allergy testing/hyposesitization - skin testing is considered the gold standard by most allergists in the United States. Blood test results do not correlate well to skin test results. In our practice skin testing is the method of choice to diagnose and treat skin and respiratory allergies in the horse.